Home › Toys › Kiddey Princess Castle Kids Play Tent - Indoor/Outdoor Pink Children Playhous..
Kiddey Princess Castle Kids Play Tent - Indoor/Outdoor Pink Children Playhous..
Kiddey Princess Castle Kids Play Tent - Indoor/Outdoor Pink Children Playhouse Great Gift Idea for Boys/Girls, Easy Set up and Storage, Includes a Carrying Case, Best Quality 100% Satisfaction Guaranteed. JUST WHAT YOUR LITTLE ONES NEED: An outstanding Princess Castle Kids Play Tent will add an addition to any girl's playroom or garden. Guaranteed for hours of fun and creative play!, With the Spacious 53" HT and 41" by 41" W there is enough place in the Pink Children Play Tent for your children and their friends to play, and then you can store and travel with it easily with the carrying case measuring a total of no more than 18" by 2" as pictured. SUPREME DURABILITY: When you buy the Princess Castle Kids Play Tent from Kiddey, you can rest assured that you purchase top-line quality Children play tents that are made to last! SECURELY GROUNDED: Thanks to the added ground pegs. These ensure that your princesss castle stays firmly in place and doesnt move even during times of relentless playing! EFFORTLESS SET-UP: Click add to cart now and you wont only get this premium quality princess play tent. But you will also receive a set of step by step instructions to set it up without struggling! Dont get this play tent if you are not ready to see the whole neighborhood gathering at your home! Why? Because girls LOVE pretending to be little princesses. All girls from the neighborhood will suddenly want to be your daughters best friend! 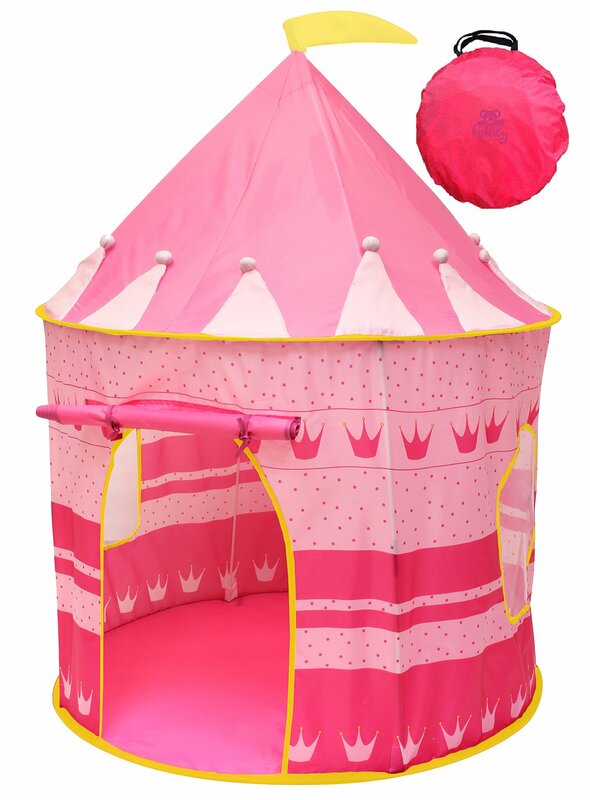 Introducing The New, High Quality Princess Castle By Kiddey The Adorable &Incredibly Fun Play Tent That All Girls Love Are you looking for an incrediblyexhilarating play tent for your little girls? Then you have come to the rightplace! Kiddeys Princess Castle is a guaranteed hit that your little ones willdefinitely love. Now you can let them enjoy endless hours of creative playalone or with their friends without breaking the bank!WHY CHOOSE US? Kiddeys Play Tent Promises Tons Of Fun! Watch your little ones scream inexcitement and joy as they have fun pretending to be a princess in their own,gorgeous castle! Kiddeys Play Tent Boasts Its Supreme Durability! Arentyou tired of poorly made play tents that tear apart after a few weeks of use?You can rest assured this wont happen with this one. Kiddeys play tent ismanufactured upon the highest quality standards and offers unparalleleddurability. When you buy from Kiddey, you buy QUALITY THAT LASTS! Unparalleled Cuteness, Yet Extremely Practical! Kiddeys princess castle comesalong with a BONUS bag for effortless carrying or storage. Mesh windowsallows natural air-conditioning!! Easy to open/close door With Step By StepInstructions! Set it up fast and easy and let your kids have fun right away.Simply use our practical, step-by-step instructions to set it up in a fewminutes without struggling! Kiddeys Play Tent Stays Firmly In Place!Thanksto the added ground pegs that provide enhanced stability.Also, theergonomically designed, perforated windows minimize sweating, heat and allowfor proper ventilation! What are you waiting for?Dont Miss This Chance Click Add To Cart Now Before We Are Sold-Out Again!